Update: There’s a newer version of this watch – read the complete Vivofit 3 review here. Let’s begin our Garmin Vivofit 2 Review with the design: Having a comparable design to the Fitbit Charge or the Jawbone Up2 it also feels pretty lightweight. Similar to the original Vivofit you can take out the original tracking module and put it into any other strap you have. The bright display itself is good to read also when you are in the dark. In contrast to other fitness trackers on the market, the Vivofit has a twist clasp that holds the Garmin Vivofit 2 safely on your wrist. And you can get one of at least 13 different colored bands in two different sizes officially available from Garmin. Take a look at the color examples in the image below! Many people get annoyed with energy hungry devices they need to be charged every other day. Even most of our smartphones must be charged at least every week. That’s where the Garmin Vivofit 2 shows its full potentials: Even though it has an always on display, the battery life will last more than one year and you do not have to recharge it at all. Once the battery (CR1632 coin batteries) is low just replace it with a new pair of batteries! So it’s no problem to make a long holiday without any recharging. If you love go camping, hiking or sailing or being at places that don’t provide electrical energy, the Garmin Vivofit 2 will be your preferred fitness tracker. The main features of the Vivofit 2 are step counting, distance measurement and calories counting. 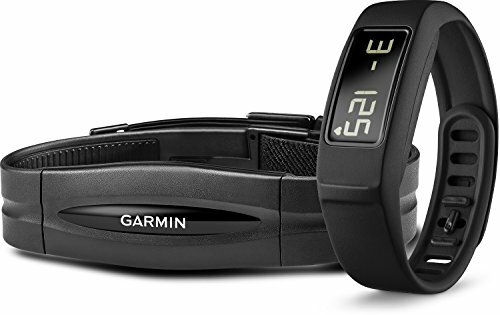 Heart rate monitoring is only available if you buy it as a bundle with the heart rate monitor from garmin. Of course the fitness tracker will be able to show you the clock and you can set a daily target for your activity. A basic stop watch functionality is also included. It will alarm you with a sound when your are inactive and it also will analyze your sleep pattern. Track your progress and receive virtual awards online on Garmin Connect. You also are able to share your progress with your friends or family and take part in competitive online challenges. Is Garmin Vivofit 2 rechargeable? Having inside two replaceable CR1632 coin batteries, you don’t have to worry about any charging cables at all. The battery’s life will last one full year of fitness tracking. Is the Garmin Vivofit 2 waterproof? The device is waterproof rated 5 ATM so you are able to use it while swimming! What activities does it track? The Garmin Vivofit 2 recognizes your steps taken throughout the day, your distance traveled, your calories burned and how well you sleep at night. Will the Garmin Vivofit 2 work with my phone? The Garmin Vivofit 2 works perfect with your smartphone if you have at least Android 4.3 or iOS 7.0 and Bluetooth 4.0 low energy. Move bar w/audible alert- Reminds you to stay active throughout the day by displaying a red move bar and sounding an alert after one hour of inactivity. Additional segments lightup for every 15 minutes of inactivity. Walk for a couple of minutes to reset. Backlit Display - The display is always on so you won't miss a beat. Turn on the backlight to see your stats, even in the dark. Sensor Compatibility - Pairs with heart rate monitor chest strap (included in bundle package).